LE shii can be used for cultivation shii-take on pasteurized as well as on sterilized substrates. This strain produces dark oak-brown fruit bodies and a white-pale stem. The cap diameter is 5 till 10 cm. LE 2 has an excellent flavour and long shelf-life. This growing proposal is based on sterilized substrates. The substrate can be based on oak-sawdust from the furniture industry that must be free of sand, chemicals like paint or glue and not older than maximum 1 year. The size of the sawdust particles must be 1 till 3 mm. bigger particles are more difficult to incubate by the mycelium, what will give more risk on ‘green moulds’. Before filling the substrate in polypropylene-bags the moisture content should be about 65%. It is very important to water the sawdust very homogeneously. A concrete-mixer can be very helpful for this or make a flat pile that can be mixed by a frond-end loader. To bring up the nitrogen content to 0,5 till 1% it is possible to use supplements that will give a better production. Products that bring up the nitrogen are corncobs, rice bran, maize- meal, wheat bran, etc. In average use 5 till 25% supplement of the wet substrate. A good recipe is; oak-sawdust, 5% rice bran, 4% maize meal and 1% CaCO2 to control the pH. Before filling in bags the substrate should have the following values; moisture-content 65%, pH 4,5 till 5,5 and a nitrogen content of 0,5 till 1%. The substrate can be filled in special polypropylene-bags with filtering. These filters must be resistant to the heat-treatment in an autoclave. Fill the bags just for 80%, this makes it easier to spawn after sterilization. The temperature in the substrate should be 121 ºC for 1 hour with an over- pressure of 1 bar. The spawning procedure must be done under very hygienic conditions. Optimally is to do it in a filtered over-pressure cabin, where the bags are opened for a very short moment to spawn it with the mycelium. Recommended spawning-rate is 1 till 1,5% of the substrate-weight. LE shii has a slow mycelium growth. Incubation takes about 10 till 15 weeks to colonize the bags completely. 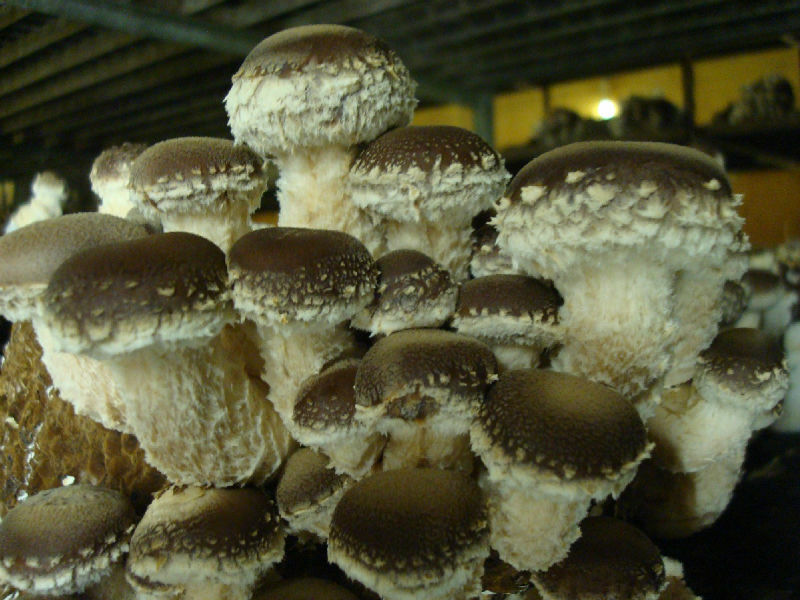 Longer incubation gives a higher yield in the first flush and produces bigger fruit bodies. In this period the substrate temperatures should be 25 till 27 ºC and a high humidity of 95%. At the end of incubation it is advisable to shake the bags in order to improve the later pin setting. When the bags are full- grown, cool down to 14ºC air-temperature and 17 ºC substrate-temperature. The relative humidity should be kept high on 95 % with sufficient fresh air CO2 -level about 1000 ppm. First keep the bags closed till the pins are visible. In this period the mycelium will start colouring brown and the fruit bodies will start to grow. Make sure that the plastic on top is not sticking on the surface of the logs (lift the plastic every day if necessary). When the small pins are formed under the plastic than take it off and keep the relative-humidity high on 95%. Picking can be started at about 10 days after opening the bags. Important is to clean the logs after the first flush, take of all the rest parts and old pins and stems. Than give a cold shock by dipping into cold clean water for 24 hours or spray the bags with cold water. Keep a constant climate in the room of 15ºC air-temperature 95% RH and CO -level on 1000ppm.